Armenians are a mixture of many different people, including Persians and Greeks, and Semites, and who ever disagrees with those facts are not bound by the facts of life nor the truth that is unwanted by the bulk of Armenian people... Persian tribes existed in that area just as long and to think that neibhors dont interact or mix is unreasonable... Persians and armenians were once very close, infact my mother brought a historic book from Armenia which specifies that the Persians and Armenians spoke a similiar language and were able to understand each other. you're lost. there are so many nontruths to this quote alone, that your post is simply not worth responding to. Edited by hytga, 14 September 2005 - 07:25 PM. Well its only partly accurate compared to some other statements that are completely inacurate. I have a problem with declarations of 'European race' and "Middle Eastern" race. It's as if peoples who live in the broad geographical region of Europe all belong to one anthropological type, while those who live in the the broad geographical regions of Near East, Middle East, all belong to another anthropological type. If one looks for the predominant geographical ethnic make-up of the Armenian people, than one should look no further than South Caucasian and Anatolian. Armenians just happen to fall into the Europoid type called Balkano-Caucasian. Our enemies such as Turks and Azeris, just happen to fall into the same cluster. You are mixing language family tree and genetic traits. As for Armenians being European or not. I for one, knows I am not European, I am not born in an European country and do not live in Europe. Armenia is not in Europe proper. Armenians that are born or lived in Europe are Europeans, the rest are not, it is as simple as that. All this fight about Armenia being European or Armenians being European is worthless and senseless. Domino, you are not born in Armenia and you are not living in Armenia. You have no right or say in this matter. Armenians in Armenia consider themselves as Europeans and their country European on all levels. Armenia is recognized as a European country by all European official institutions. End of story. They consider Kazakistan, Turkey, Azeraiijan, European too..., revisionists of the Armenian genocide say it did not happen, doesn't mean it did not happen, much like, it isen't because there are European bodies including such countries that it makes them geographically European. Besides, Europe is a social construct, as a continent, it could be debated..., and this BS about "white" "blue eye, white sking"... doesn't mean any st. Canada could be considered culturaly European too... it isen't in Europe, like Australia is not. You can fight such a worthless war of words in a World that has no real frontier anymore, about a pass dated bogus term..., it's your choice. I agree! BTW, I don't put any significance in anybody's origins, but for the record people of Indo-European stock in Caucasus are only the Osetians, Armenians, partly Abkhazians, Adjarians and the various minority groups of Slavic origin and Greeks. Georgians are predominantly Kartvelian, while the rest of Caucasus ethnicities are of Turko-Altaic stock. 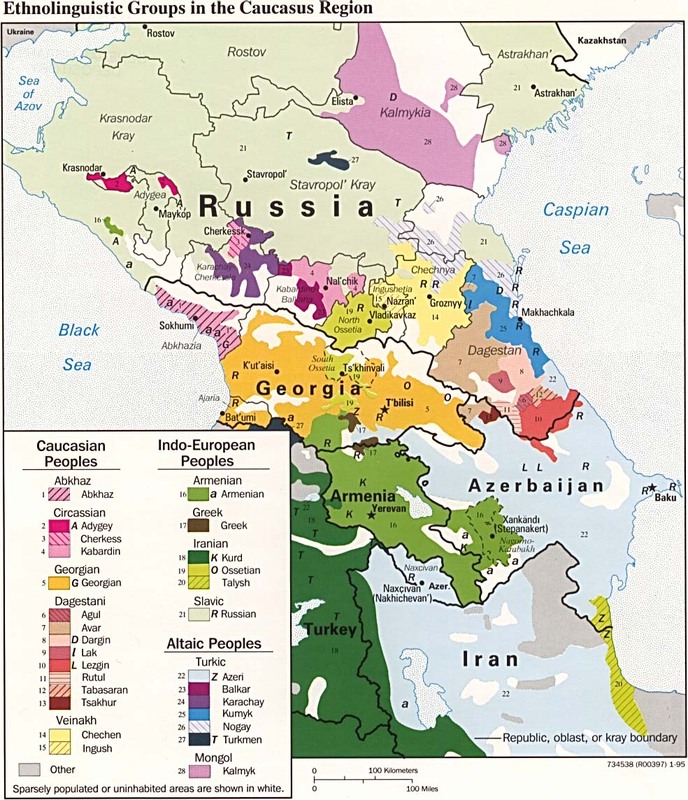 PS: this map shows most (although not thorough) shows most linguistic groups in Caucasus. Edited by gamavor, 17 September 2005 - 12:12 AM. At times like this, I'm just glad I'm American. Makes things sooooo much easier. Ok so we are Europians, or Asians, one can be confused, one thing is surthen, being ither one of them, how does it help us or hurt us? I know of no country or nation that can claim 100% genetic uniformity or cultural homegenity. And Armenia too, a geographical region of the Middle East has had more than any other nation perhaps, a vast influx of peoples throughout history. However the land is harsh and only the most determined would stay and survive there and make a home for themselves. So inturn they would become part of the majority Hygagan culture. We have been through before the Jewish Khm-bat (Smbat) leader of Jewish slaves sent as a gift to Takavor Hratch for helping the Assyrians, the Hindu refugees settled in the province of Taron after fleeing a military coup in western India in 149BC which was the same year the Iranian dynasty of the Arshakunis came to power under Takavor Vagharshak and of course we have long ranted about the Chinese (Shu) origins of the Mamikonian (Mamgun= Peoples Army in Chinese) who fled to the Iranian Empire before being forced to resettle in Armenia in 268 AD etc etc. Today in Hyastan we can look at the example of the Yezidis who are perhaps more patriotic than some Armenians who prostitute the Armenian village girls! Hmmm, perhaps it is this genetic diversity coursing in our veins that makes it easy for us to relate and socialise with foreigners, but makes it hard for us to socialise with each other as we imagine that we must look the same and think the same, which is bullsh*t.
Edited by Ata Donme, 18 September 2005 - 05:31 AM. Gams, what do you mean by stock? Is that a racial/anthropological term? Because that's what 'stock' means to me. And when you say that the other Caucasus ethnicities are Turko-Altaic stock, does that mean that Chechens, Ingush, Dagestanis, Circassians, are of Turko-Altaic stock? Their languages are classified as Caucasian. I look at my photoalbum of a elementary grade class where the majority of the classmates just happen to be Azeris (there is one other Armenian in that photo besides myself and one Russian the rest of the kids are Azeri). Only a couple of them show slight asiatic (central asian) features, the rest just look "caucasian". True, some official bodies do. The people don't and that's what matters. Not the same with Armenia, Georgia and Cyprus. revisionists of the Armenian genocide say it did not happen, doesn't mean it did not happen, much like, it isen't because there are European bodies including such countries that it makes them geographically European. Besides, Europe is a social construct, as a continent, it could be debated..., and this BS about "white" "blue eye, white sking"... doesn't mean any st. Canada could be considered culturaly European too... it isen't in Europe, like Australia is not. One fallacy after another. You can do better. When there is nothing to be said, some will rather target the person. Slander the messager and wish that it'll defeat the message. But that's in your world sorry. Oh another thing, just for your information, there is an HLA, that I got negative, that middle Easterns do get positive tested for, and guess what, Armenians usualy are the people that get tested above average positive for it(it's even considered as an "Armenian" originated). You'd better test it. And besides, I had blue eyes the first years of my life, then green, ..., and one side of my family, they've got blue eyes... remind me to join KKKs or being baptisized European. Oh and, I was not tested positive for nonesense, maybe you should be tested too, never know. All this talk for nought. As Artaxias said the 'provocatuer' knew well the reaction. Being "white" and being European have very little in common. Being European is cultural and civilizational threat that has little to do with ethnicity. For example the American offspring of European settlers in America have little to do with Europe and Europeans, although their anthropology is exactly the same as their European counterparts. Likewise, Turks in their predominant majority are rather Balkan and Caucasoid types, but hardly Turkey as a nation and Turks in general can fit into or be recognized as Europeans. With the same token, Armenia and Armenian culture is European, simply because she belongs to that cultural and civilizational stream that we identify as European. And of course while this is true, it is also true that despite the resiliance and resistance against assimilation (especially in the Middle East) many Armenians can easly be confused for something else, and I personaly don't blame them. Skhara, all the ethinicities mentioned by you are of turkic origin who followed the patterns of their turkish brothers. They don't look asian because they have mixed for long time with Slavs, Armenians and Greeks. You are crystal clear here. Armenians are European because of their culture, not their genetics nor language. Some vestiges of paganism remain in the Armenian culture though, that I would like to see expunged. Edited by phantom22, 19 September 2005 - 01:28 AM. You are crystal clear here. Armenians are European because of their culture, not their genetics nor language. Some vestiges of paganism remain in the Armenian culture though, that I would lkie to see expunged. Don't respond to this debate here. To expand on your suggestion you may choose to start a separate thread under another topic in another category.